A criminal investigation is under way following a suspected outbreak of botulism at farms on the Devon and Somerset border. It is believed up to 40 cattle have died at four farms as a result of the bacterial infection in the Hemyock and Dunkeswell area. A voluntary restriction on the movement of livestock has been put in place on the farms to contain the illness. It is thought infected poultry litter sold to the farms could be to blame. Devon County Council Trading Standards said there was a possible association with the use of animal by-products. A spokesman said: "There are strict controls covering the disposal of animal by-products and our role is to investigate the circumstances concerning any alleged non-compliance. "The case is, at this stage, a criminal investigation under the animal by-products legislation, so we are unable to give further details for risk of prejudicing the enquiry." A spokeswoman for the Department of the Environment, Food and Rural Affairs said the litter may have contained dead chicken carcasses. "The Food Standards Agency (FSA) has ensured that there is no risk to human health in this particular instance, because no milk from the infected cows went into the human food chain", she said. John Dole, from the National Farmers Union, said he believed 40 cows had died so far. "Accidents do happen, even with the best will in the world, but I would assess it's a totally isolated outbreak," he said. 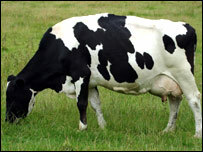 The FSA said on Thursday it was aware of "several incidents involving suspected botulism in cattle in Devon". A spokesman added: "There have been no reports that meat or milk from cattle affected by botulism can cause human disease, but as a precautionary measure meat and milk from the farms where outbreaks have been reported has been withheld from the food chain. "The FSA is continuing its investigations in conjunction with the Veterinary Laboratories Agency."